Bach’s Partitas, English Suites and French Suites – six of each – collectively rank among the glories of the keyboard literature. Each is a four-part sequence of dance movements, all in the same key but varied by rhythm, tempo and mood: Allemande, Courante, Sarabande, and Gigue. Each has a different national origin, respectively German, French, Spanish and English/Irish. To this basic framework additional movements, usually of French origin (Minuet, Gavotte, Bourrée, Passepied, etc.) are found between the Sarabande and Gigue. These dance movements are generally in two-part form, with each half repeated. An imposing Prelude introduces each of the Partitas and English Suites. The moniker “English” Suites is a misnomer. Bach did not so designate them, and even if he had, they are stylistically more French than English in their orientation, taking as their point of departure the keyboard style of French harpsichord music. Like Franz Liszt two generations before him, Ferruccio Busoni (1866-1924) spent the earlier part of his career on the concert circuit as one of the most sensational piano virtuosos of his time. Also like Liszt, he arranged and transcribed numerous works for piano solo. In 1909, he published four “books” collectively called An die Jugend (each lasts only four or five minutes) of his freely adapted transcriptions of other composers’ music. The third of these was based on the music of Mozart. The three sections are played without pause. The gigue is derived from Mozart’s Gigue K. 574, the “bolero” is actually a free fantasia on the fandango (a courtly Spanish dance) in the third act of The Marriage of Figaro, while the virtuosic variation is developed from the gigue material. This piece is an expansion of an idea that dates back to 1974 and was initially intended to become part of Knussen’s Third Symphony, which occupied him throughout the 1970s. Fragments then went into his Ophelia Dances, Book I (1975) for chamber ensemble, and finally found their way into the present work for solo piano, thus “continuing the dance in various ways,” as the composer says. Weber composed his brilliant Aufforderung zum Tanze (Invitation to the Dance) as a solo piano piece in 1819. It may well have been the first concert waltz (one conceived specifically for listening rather than for dancing), but its popularity was ensured through choreographic interpretation, beginning with Berlioz’ orchestration for the Paris Opera in 1841. The “invitation” portion lasts only a small fraction of the entire work. According to Weber’s own explanation, the invitation by the gentleman is made to the lady in the opening passage, followed by her demure responses and eventual acceptance. The dance is a series of contrasting waltzes, during which the dancers declare their love. At the end he thanks her. They part. Silence. Schubert wrote an enormous number of little dance pieces for piano – waltzes, galops, Ländler, Deutsche, écossaises and minuets – to the tune of nearly four hundred. From this vast treasure trove Liszt chose nine waltzes and filtered them through the alembic of his own musical personality, calling them Soirées de Vienne, or Valse-Caprices. Biographer Bryce Morrison notes that Liszt was attracted to Schubert’s waltzes because of “their mix of both subtle and direct qualities,” which resulted in Liszt “tinting their exuberance and melancholy with a stylized command peculiarly his own.” Liszt was obviously fond of these works, first published in 1852, as he performed them often. The sixth is by far the most popular of the Soirées, with its sturdy opening theme, its echt Viennese lilt and its numerous passages of scintillating filigree decorating Schubert’s charming melodic lines. Carnaval consists of 22 musical vignettes all constructed from three tiny motifs whose notes are derived from the name of a little German town, Asch. (Today it is As, just over the border in the Czech Republic, near Bayreuth, Germany). This was where Schumann’s current flame, Ernestine von Fricken, came from. Schumann met Ernestine at the Leipzig home of the piano teacher, Friedrich Wieck, with whom she lodged and studied piano. Matters progressed to the point where Schumann and Ernestine became engaged in December of 1834. That month he began writing the music that became Carnaval. As any student of music history knows, Schumann jilted Ernestine in favor of Wieck’s daughter Clara. But for the moment, the 24-year-old composer was infatuated with Ernestine. He discovered that the four letters of Ernestine’s birthplace, Asch, were also in his own. (In German terms, S=Es (E-flat), and H=B-natural.) The coincidence seemed to Schumann like fate knocking at the door. He loved puzzles, ciphers and numerical symbolism. This provided just the stimulus he needed to begin a new, large-scale composition. Schumann arranged the Asch motto into two additional variants – S-C-H-A and AS-C-H (As=A-flat) – and later inserted all three mottos into the score between the eighth and ninth numbers (between “Réplique” and “Papillons”) as double whole notes, calling them “Sphinxes,” meant only to be seen, not heard. 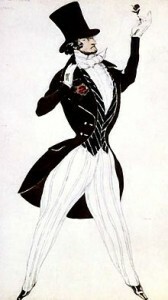 Every piece in Carnaval except the “Préambule” is based on an ASCH motif, which usually appears at the opening and is then developed in ways both obvious and obscure. The autobiographical element of Carnaval goes further. Characters from Schumann’s life – both real and imagined – are portrayed, including his wife-to-be Clara (“Chiarina”), Estrella (“Ernestine”), Chopin and Paganini. Then there are the two aspects of Schumann’s musical personality: the quiet dreamer as reflected in Eusebius, and the passionate intensity of Florestan. Figures from the commedia dell’arte of Italian carnivals make appearances: Pierrot, Arlequin, Pantalon and Columbine. Other images of a masked ball at carnival time (the pre-Lenten season) make fleeting appearances. The final number portrays the rout of cultural philistines by the band of David, marching defiantly in 3/4 metre.